Perfectly scaled for travel...this small but mighty spiritual tool is filled with the ashe from both the Eshu ceremonies and the Ancestors ceremonies at the Sacred Gardens of the Orisa in central Florida. Each one is a one-of-a kind creation with your name blessed into it. The shells may vary in coloring and shape as they are made by nature and no two are alike. This one is approx 1" in length. 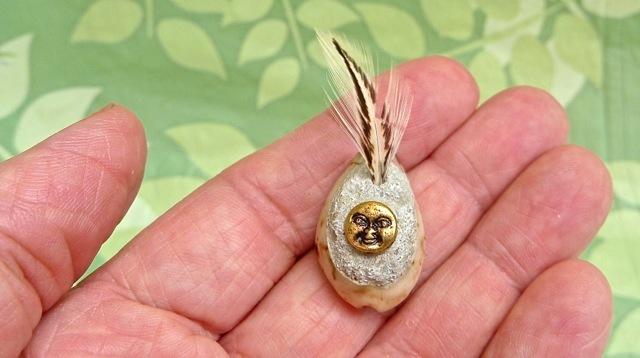 The miniature bronze face is nestled into the concrete along with a tiny feather. Benefits are: To have the opportunities for more alignment to finding the source of energy connected with the ancestors.